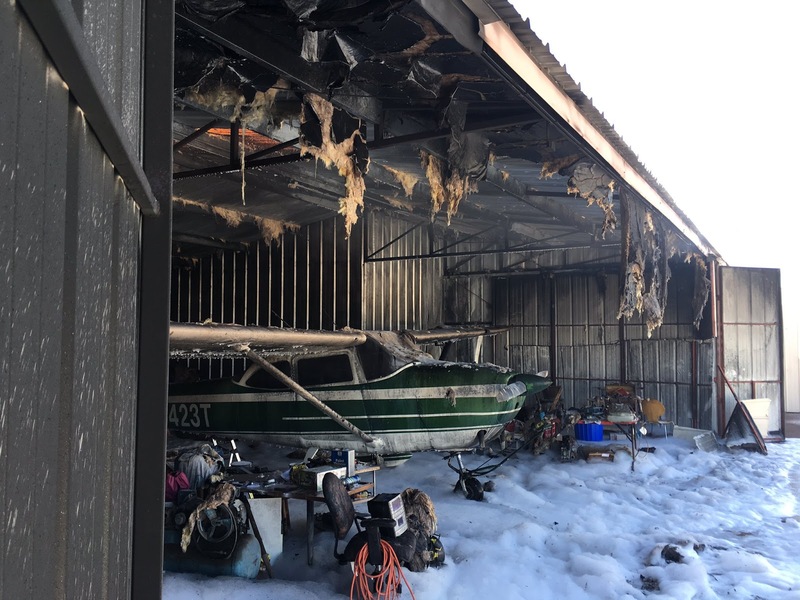 A fire broke out at the Chandler Municipal Airport on Saturday afternoon. Fire crews were able to contain the fire to two hangars. At least one plane appeared to be charred, and the roof of one hangar showed heavy damage. There was also a big mess of foam left behind in the wake of the fire. One firefighter suffered a minor injury to his arm and was transported to Chandler Regional Medical Center. Chandler Municipal is one of the nation’s 50 busiest general aviation airports. It serves as a base for charter, transport, and sightseeing excursions, and is home to training institutions. The private pilot stated that, shortly after takeoff, the airplane would not maintain a positive rate of climb. The pilot reported that he had previously experienced this on hot days, so he continued to make small control corrections in anticipation of the airplane gaining altitude; however, once it reached about 200 ft above ground level, the airplane began to sink. The pilot then decided to retard the throttle and perform a forced landing into a field. The airplane landed hard, resulting in substantial damage. The airplane was operating in a high density altitude environment and at the upper limit of its takeoff performance envelope at the time of the accident. Additionally, the pilot did not lean the engine’s fuel mixture control before takeoff as recommended by the engine and airframe manufacturers’ operating instructions; therefore, the engine was likely not producing full power, which resulted in the airplane’s inability to climb. Further, the engine’s spark plugs exhibited carbon fouling signatures consistent with an overly rich fuel-to-air mixture. Postaccident examination revealed no mechanical anomalies that would have precluded normal operation. The pilot's failure to sufficiently lean the engine’s fuel-to-air mixture for the given density altitude, which resulted in reduced engine power output and the airplane’s inability to climb. 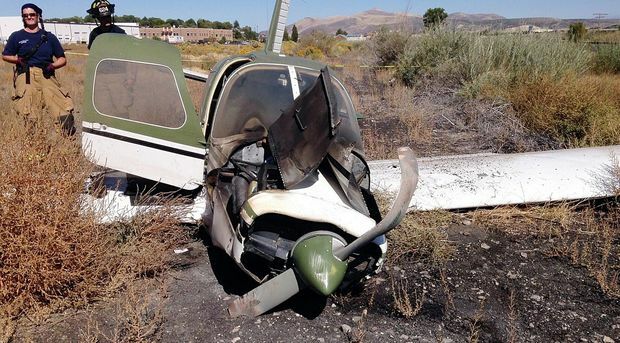 On September 23, 2015, about 1328 Pacific daylight time, a Piper PA 28/140, N56897, collided with terrain shortly after takeoff from Elko Regional Airport, Elko, Nevada. The airplane was registered to and operated by the pilot under the provisions of 14 Code of Federal Regulations Part 91. The private pilot sustained minor injuries, the passenger sustained serious injuries, and the airplane was substantially damaged. The cross-country flight departed Elko about 1326, with a planned destination of Nampa Municipal Airport, Nampa, Idaho. Visual meteorological conditions prevailed, and no flight plan had been filed. The pilot stated that he and the passenger had departed from their home field of Kidwell Airport, Cal-Nev-Ari, Nevada, about 0715 that morning. He intended to start the day early, due to the hot weather conditions en route. They stopped at Perkins Field Airport, Overton, Nevada, where they serviced the airplane to capacity with fuel, and then flew north towards Ely, Nevada. Having reached Ely and passed through Ruby Ridge Pass at an altitude of 8,800 ft mean sea level (msl), the engine began to run slightly "rough"; this had never happened before. The pilot adjusted the fuel mixture towards the lean position, the engine smoothed out, and an increase of 200 rpm was observed. He reported that he typically operated the engine at full rich fuel mixture during takeoff and cruise. Having reached Elko, the pilot serviced the airplane with the addition of 15 gallons of fuel in the left tank, and 10 gallons in the right tank. He specifically did not want to fill the tanks to capacity as they were close to their destination, and he was concerned about performance degradation in the high temperature and elevations. The passenger was in the front right seat, and there were two bags in the back seats, both less than 10 pounds in weight. He then started the engine about 1320, and the run-up was uneventful. The engine was operating normally and he began the takeoff roll on runway 12, as the other runway (6/24) was closed for construction. He had flown in and out of Elko before, and surmised that the length of runway 12 (3,012 ft), while adequate for takeoff, left him with minimal options should an emergency occur. The airplane accelerated normally, and shortly after rotation, the controls began to feel "mushy"; He had experienced this before in hot weather conditions. He continued the initial climb, and gently applied control inputs, and anticipated that the airplane would regain a positive climb rate like it had in the past. However, the airplane would not climb more than 200 ft above ground level (agl). Having crossed the street at the end of the runway the airplane began to descend. As the descent continued he flew over warehouses, and he decided to retard the throttle and land straight ahead in a field. Just prior to impact he pulled the yoke aft to reduce airspeed and resultant energy forces. The airplane landed hard in the field, shearing off both main landing gear, and crumpling the fuselage just aft of the cabin. The pilot reported that at no time did the engine make any coughing or sputtering sounds, and that it kept operating normally throughout. Witnesses who observed the airplane takeoff all recounted similar observations, as it appeared to be flying slowly after rotation, and did not gain significant altitude. One witness stated that the nose of the airplane was unusually high as it began to descend out of view behind buildings. None of the witnesses observed smoke or vapors emitting from the airplane during flight. At 1356, the automated surface weather facility at Elko Airport reported wind variable at 5 knots, gusting to 18 knots, 10 miles visibility, temperature at 27° C, dew point -6° C, and an altimeter setting at 30.13 inches of mercury. The airport was located at an elevation of 5,139.8 ft msl. The closed runway, 6/24, was 7,455 ft long. Runway 12/30 had a limitation that takeoffs were only permitted on runway 12, and landings only on runway 30. The Federal Aviation Administration (FAA) Airport Facilities Directory reported that runway 30 slopped steeply upwards. The density altitude at field elevation about the time of the accident was about 7,400 ft. The airplane was recovered, and examined by the NTSB Investigator-in-Charge, and representatives from the FAA and Piper Aircraft. The examination revealed that the engine fuel mixture control was in the full-forward (full rich) position. The top spark plugs were removed and examined. All electrodes exhibited "normal", to "normal-worn" out wear signatures, indicative of normal service life when compared to the Champion Aviation AV-27 Check-a-Plug chart. Plugs 1, 3, and 4 exhibited dark grey discoloration and sooting, and plug 2 was coated in black soot consistent with "carbon fouled" when compared to the Champion chart. No mechanical malfunctions or failures were observed during the examination. A full examination report is contained within the accident docket. The airplane performance chart located in the Piper Pilot's Operating Manual, defined that at a gross weight of 1,950 pounds, with zero wind, flaps 0, on a paved level and dry runway, and a density altitude of 7,000 ft, the takeoff distance would be about 1,550 ft; with a distance to clear a 50 ft obstacle of about 3,300 ft. At the maximum gross weight of 2,150 pounds, the takeoff and clearance distances increased to 1,700 and 3,600 ft respectively. A notation on the chart stated, "EXTRAPOLATION OF CHART ABOVE 7,000 FT IS INVALID". "NOTE: Mixture full rich except a minimum amount of leaning is permitted for smooth engine operation when taking off at high elevation." "For 5,000 ft density altitude and above or high ambient temperatures, roughness or reduction of power may occur at full rich mixture. The mixture may be adjusted to obtain smooth engine operation. For fixed pitch propeller, lean to maximum RPM at full throttle prior to take-off where airports are 5,000 ft density altitude or higher. Limit operation at full throttle on the ground to a minimum." 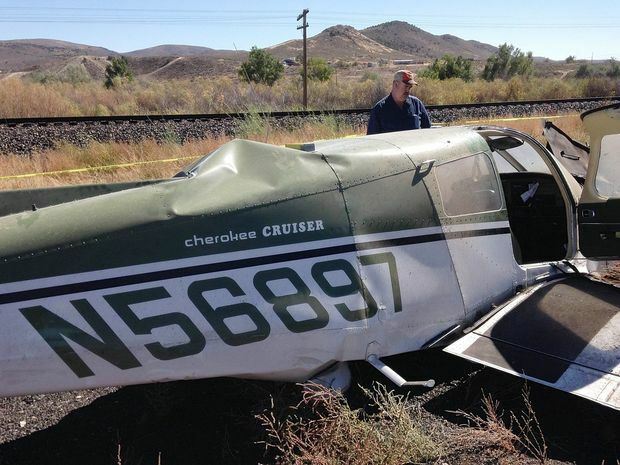 On September 23, 2015, about 1328 Pacific daylight time, a Piper PA 28/140, N56897, collided with terrain shortly after takeoff from Elko Regional Airport, Elko, Nevada. The airplane was registered to, and operated by, the pilot under the provisions of 14 Code of Federal Regulations Part 91. The private pilot sustained minor injuries, the passenger sustained serious injuries, and the airplane was substantially damaged. The cross-country flight departed Elko about 1326, with a planned destination of Nampa Municipal Airport, Nampa, Idaho. Visual meteorological conditions prevailed, and no flight plan had been filed. The pilot stated that he and the passenger had departed from their home field of Kidwell Airport (1L4), about 0715 that morning. They stopped at Perkins Field (U08) for fuel, and again at Elko for fuel just prior to the accident. The pilot reported that the engine run-up was uneventful, and they departed on runway 12, because the longer runway (5/23) was closed for maintenance. Shortly after getting airborne, the airplane did not maintain a positive rate of climb. The pilot reported that this had happened in the past on hot days, so he continued to make small control corrections in anticipation of the airplane gaining altitude. However, once it reached about 200 ft above ground level, the airplane began to sink. After crossing over an adjacent highway and a group of warehouses, the pilot decided to retard the throttle and perform a forced landing into a field. WTIC-AM has halted the use of its trusty and venerable traffic plane, moving to ground-based technology such as cameras that beam key information to commuters via apps and smartphone data and video. The Farmington-based CBS news and talk radio station said in an emailed statement it discontinued airborne traffic reports April 3. It's instead using a "system of live cameras that's more accurate, more comprehensive and allows for full online and social media integration." "Typical aviation coverage only allows us to monitor one specific area at a time, which makes it less relevant in a society of smart phones, cars and roads," the station said in the statement. More data is available "through the use of this camera system allowing us to monitor real-time travel conditions 24/7," WTIC said. It did not provide details on the location of cameras or what prompted the shift. Derrick Hinds, communications manager of the Radio Television Digital News Association, said some stations "have been scaling back" traffic reports from the air over the past decade. He cited the cost of maintaining a helicopter or plane, pilots' pay, fuel and other expenses. In large media markets, airborne traffic reports may still be common, but elsewhere, "it's gradually been dropping," he said. Traffic apps such as Waze, Google Maps and state Department of Transportation TV monitors and pavement sensors installed by transportation officials can steer motorists along faster routes and away from potential delays caused by traffic jams or construction. Unmanned drones that relay aerial photos also are replacing planes and helicopters piloted by humans, Hinds said. Drones are cheaper than traditional alternatives, he said. And no injuries or fatalities result from occasional crashes. Mike Alan who started flying a red-striped Cessna Cutlass over central Connecticut in 1980, reported for years for WTIC-AM. He was joined by Mark "the Shark" Christopher, who drove WTIC's Car One. Christopher reported for WTIC-FM. Alan listened to air traffic control at Brainard Airport, monitored traffic below, and communicated with other traffic reporters while reporting to listeners every 10 minutes, according to a 2002 profile in The Hartford Courant. "For me, this is my office," he said of his plane at the time. The loss of instantly recognizable on-air traffic reporters that add to a radio station's brand is one drawback of a radio station's decision to quit traffic reporting from above, Hinds said. "They become an additional personality on the station if you can use them," he said. The private pilot of the tailwheel-equipped airplane stated that, during the landing roll, the airplane began to veer to the left. The pilot used both brake and rudder inputs in an effort to return to the runway centerline; however, despite the pilot's attempts to regain directional control, the airplane continued off the left side of the runway and ground looped. Postaccident examination of the left landing gear and braking system revealed no evidence of mechanical malfunction or failure that would have precluded normal operation. The pilot's failure to maintain directional control during the landing roll, which resulted in a runway excursion. On August 16, 2015, about 1915 mountain daylight time, a Taylorcraft BC-12D, N43616, experienced a brake system malfunction during the landing roll at the Libby Airport, Libby, Montana. A private individual owned the airplane and the pilot was operating it under the provisions of 14 Code of Federal Regulations (CFR) Part 91. The private pilot and passenger were not injured; the airplane sustained substantial damage. The cross-country personal flight departed from a remote grass airstrip in Yaak, Montana about 1845 with a planned destination of Libby. Visual meteorological conditions prevailed and the pilot had not filed a visual flight rules (VFR) flight plan. The pilot stated that after completing the approximate 20 minute flight, he configured the airplane to land on runway 33 at the Libby Airport. Upon touchdown, the airplane began to veer to the left. The pilot used both the brake and rudder inputs in an effort to return to the runway center. Despite the pilot's attempts to regain directional control, the airplane continued off the left side of the runway and ground looped. The airplane incurred substantial damage to the wing spar. The pilot further stated that the loss of directional control was precipitated by a landing gear malfunction. He opined that the left brake likely seized after touchdown, which was evident from the skidmark on the runway surface. The brake system was the original cable-operated drum brake. The left landing gear was locked immediately after the accident, but after several hours was free to turn again. A Federal Aviation Administration (FAA) certified airframe and powerplant mechanic examined and disassembled the left landing gear. He stated the examination of the braking system revealed no evidence of mechanical malfunction or failure that would have precluded normal operation. He further stated that he could smell a burned odor from the brake, but they functioned normally. The pilot reported that, during approach, while flying from the rear seat of the tandem-seat, high-wing airplane, he “needed to lose speed and altitude.” He placed the airplane in a right-wing-low, forward slip, and he added that the airplane had poor forward visibility at slower speeds. He aligned the airplane with the center of the runway and “pulled the nose up slightly to slow [down],” and a “wind gust” came from the right and “pushed” the airplane over the trees. He “saw [the] tree tops coming up fast under [his] left wing,” and “out of shear instinct, [he] banked slightly right to avoid going in nose first.” The airplane collided with the tree tops. The airplane sustained substantial damage to both wings and the empennage. The automated weather observation system about 3 nautical miles from the accident site, about the time of the accident, reported that the wind was variable at 3 knots. The pilot landed to the southwest. The pilot’s unstabilized approach and failure to go around, which resulted in impact with trees. The pilot reported that during approach, while flying from the rear seat of the tandem seat, high-wing airplane, he "needed to lose speed and altitude". He placed the airplane in a right-wing low, forward slip, and he added that the airplane had poor forward visibility at slower speeds. He aligned the airplane with the center of the runway and "pulled the nose up slightly to slow [down]," and a "wind gust" came from the right and "pushed" the airplane over the trees. He "saw [the] tree tops coming up fast under [his] left wing", and "out of shear instinct, [he] banked slightly right to avoid going in nose first". The airplane collided with the tree tops. The pilot reported that there were no pre-accident mechanical failures or malfunctions with the airplane that would have precluded normal operation. The automated weather observation system about 3 nautical miles from the accident site, about the time of the accident, reported the wind variable at 3 knots. The pilot landed to the southwest. 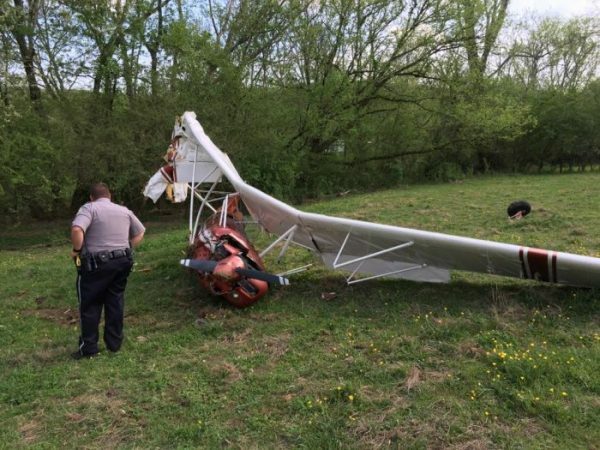 MARLOW—The pilot of a small experimental or ultralight aircraft was reported to be okay after a crash in Anderson County near Oliver Springs on Saturday afternoon, authorities said. The pilot was reported to have walked away from the crash and declined medical treatment. Authorities said federal officials have been notified of the crash of the registered aircraft. The precise location of the crash wasn’t clear, but Oak Ridge Today received reports that it was near Ray Drive and Oak Circle in Oliver Springs and north of Green Acres Mobile Home Park off Oliver Springs Highway, just east of Highway 62 (the road that connects Oak Ridge and Oliver Springs). The cause of the crash isn’t clear. Oak Ridge Today has received a report that the pilot has a small private airstrip, but we haven’t been able to independently confirm that. ANDERSON COUNTY - Anderson County authorities responded to a small plane crash outside the city limits of Oliver Springs Saturday afternoon. According to the Anderson County Sheriff's Department, a man flying an ultralight aircraft crashed near the Oliver Springs airport. No deaths or injuries were reported, and the pilot was able to walk away from the crash and refused medical treatment on the scene. The ACSO could not say how the plane crashed. The investigation has been turned over federal authorities. The airplane owner, who was a noninstrument-rated private pilot and did not hold a multiengine airplane rating, was conducting a visual flight rules (VFR), personal cross-county flight in the multiengine airplane. Before the accident flight, the pilot flew the airplane to an intermediate airport to refuel. A review of air traffic control (ATC) radio transmissions between the pilot and an air traffic controller between 0911 and 0938 showed that, during the approach for landing, the pilot misidentified in every transmission the make and model airplane he was flying, referring to his airplane as a Piper Comanche instead of a Cessna 310. Further, he did not provide correct responses to the controller's instructions (for example, he reported he was set up for the left base leg instead of right base leg as instructed), and he provided inaccurate information about the airplane's position, including its distance and direction from the airport. A witness stated that, after the airplane landed and while it was taxiing, it almost hit another airplane and golf carts, and it was taxied close enough to the fuel pumps that it "knocked" a ladder with one of its propellers. The witness said that the pilot was not "observant about his surroundings." While at the intermediate airport, the pilot requested an abbreviated weather briefing for a VFR flight from that airport to the destination airport. However, the pilot incorrectly identified the destination airport as "L51," which was depicted on the VFR sectional chart for the Amarillo area but referred to the maximum runway length available at the destination airport not the airport itself. L51 was an airport identifier assigned to an airport in another state and located north of the accident location and in a direction consistent with the airplane's direction of travel at the time of the acident. During the departure for the accident flight, the pilot taxied to and attempted to take off from an active runway without any radio communications with or clearance from ATC, which resulted in a runway incursion of an air carrier flight on final approach for landing to the runway. The air carrier initiated a missed approach and landed without further incident. The controller reported that the runway incursion was due to the accident pilot's loss of "situational awareness." Radar data showed that, after the airplane departed, it turned northward and away from a course to the intended destination airport. The northward turn and track was consistent with a course to an airport in another state. According to meteorological information, as the flight progressed northward, it likely encountered instrument meteorological conditions (IMC) while flying into rain showers. The wreckage was found in rising mountainous terrain, and the accident wreckage distribution was consistent with a low-angle, high-speed impact. Given that postaccident examination of the airplane revealed no mechanical anomalies that would have precluded normal operation, it is likely that the noninstrument-rated pilot did not see the rising mountainous terrain given the IMC and flew directly into it. The pilot had told person(s) that he flew F-4 Phantoms, but a military identification card showed that the pilot was a retired Marine lance corporal. Although the pilot's logbook showed that he had accumulated 150 hours of multiengine airplane flight time, there was no record of the actual flights showing the accumulation of 150 multiengine airplane hours or any record that he had flown military aircraft. The logbook did not show that the pilot had received any flight training in the accident airplane. The logbooks also showed that he had flown numerous flights in the airplane with passengers without proper certification and that he had not had a recent flight review as required by Federal Aviation Regulations (FARs). The pilot's logbook showed that he had once made low-altitude (10 ft above the ground) passes over a parade in the same airplane. The airplane had not received an annual inspection for continued airworthiness as required by FARs. The pilot's noncompliance with FARs and the logbook entries indicate that he had a history of poor decision-making and piloting errors, which was reflected in his behavior and actions while landing at the intermediate airport and during the taxi and takeoff phases of the accident flight. Although the pilot had a number of medical problems that potentially could have interfered with his ability to safely operate the airplane, including spinal cord injuries, diabetes, and psychiatric issues, and was taking medications to treat them, these conditions and medications likely would not have interfered with his navigational skills and his ability to communicate on the radio or affected his decision-making. Although the available medical information was limited by the degree of damage to the body, there was no evidence of a medical condition or effects of a medication that contributed to this accident. Although ethanol was detected in the pilot's tissues, it likely resulted from postmortem production. The noninstrument-rated pilot's improper judgment and his failure to maintain situational awareness, which resulted in the flight's encounter with instrument meteorological conditions and controlled flight into terrain during cruise flight. 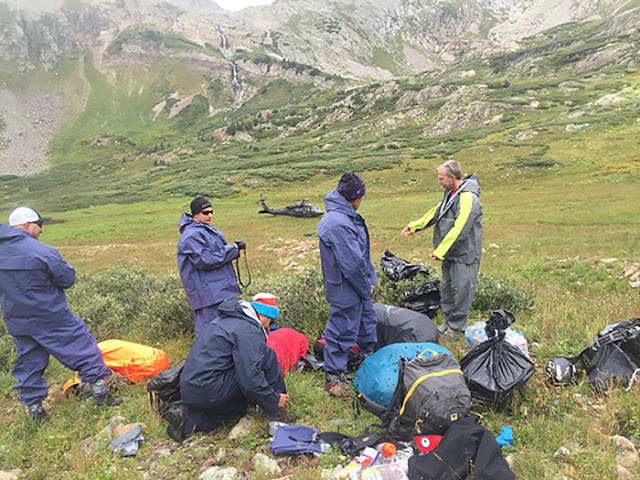 Members of the San Juan County and La Plata County search and rescue teams at the scene of the plane crash on September 7th, 2015. The Colorado Air National Guard helicopter that airlifted them to the remote location is in the background.